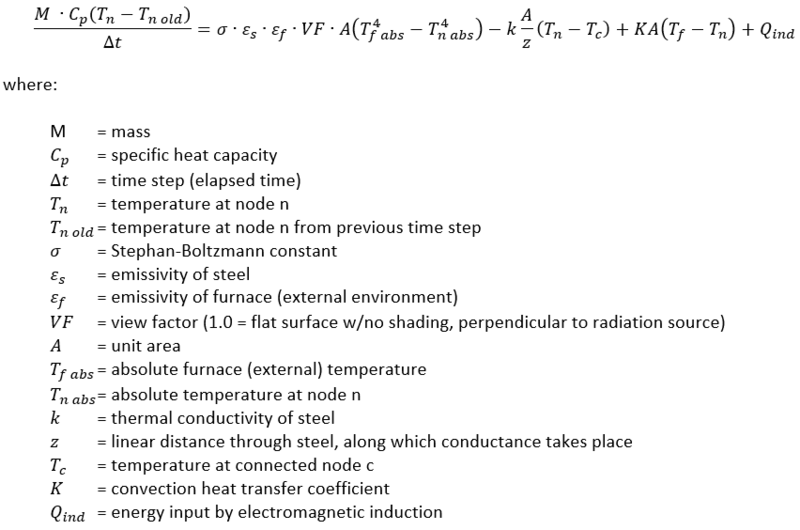 it should be noted that the values of both the specific heat and the thermal conductivity of steel are themselves functions of temperature. That means that these values need to be calculated for every node, every time a temperature matrix is loaded and solved. Finding those values means interpolating from a table of values as a function of temperature (English units). The values of the other constants are shown as well. The values for view factors are affected by shadowing caused by the structures the workpieces are sitting on (typically beams, a solid hearth, or rollers) and the workpieces each piece is sitting beside, if there is a gap between them. The values for the bottom and side views assume a solid hearth and notional effects of shading from neighboring pieces. I have written systems that considered a changing configuration of support structure over the length of a furnace and variable-width gaps between workpieces. This entry was posted in Tools and methods and tagged matrix solution techniques, simulation, sim_presentation_series, thermodynamics. Bookmark the permalink.